The videogame discussed in this essay is freely available here. This paper provides an extension of the definition of the concept of self-presence (named Objective self-presence) in digital games, and in doing so, challenges the traditional concepts of immersion and presence / self-presence in games. The design process of the submitted game Illusion Master is used as a case study to show how the related concepts of presence and immersion can be addressed in a different manner in and through digital games. It is argued that self-presence need not necessarily involve a situation where players feel as if their virtual self is their actual self. In games studies, this definition of presence is very much linked to the concept of immersion, which looks at how a player is surrounded by an immersive new reality. In this paper, it is argued that self-presence can also manifest itself through a double-consciousness where a player is both engrossed in the game, while remaining conscious of him/herself as a human being engaging with a game outside the game world. The aim of this paper is to support, and elaborate on the intentions behind the designed game artifact Illusion Master. The game, along with this corresponding paper, aim to challenge the definitions of the related concepts of unconscious illusion, presence / self-presence, and immersion in the players’ experience of digital games, proposing instead that when players are deeply involved in a game, they always remain aware of themselves as players outside the game, irrespective of their level of immersion within the game. The game, which was created before this issue’s call for papers and originally meant for exhibition purposes in a contemporary art space, was originally designed as a standalone playable reflexive artefact on the mentioned concepts in game studies. For this reason, I suggest that readers do not read further than this introduction if they haven’t yet played the game. The intentions of the designed game are not made explicit through any form of information screen in the game’s menu system. Instead, the experience is meant to be elicited through conventional gameplay and ludic conventions. Indeed, the game is designed in a way that remains playable (and possibly enjoyable) if players do not grasp the academic intentions of the artefact. It is for this reason that this paper aims to not only elaborate on the intentions, but also provide an academic grounding, as well as informally relate these intentions vis-a-vis the design of the game. The paper will be split in two sections. The first section will look at the related theories of presence / self-presence, immersion, and unconscious illusion in digital games. These will then be challenged particularly vis-à-vis the double-consciousness model introduced by Katie Salen & Eric Zimmermann in Rules of Play (2003), as well as Daniel Vella’s player-figure relation model (2014). Building upon these two theories, the paper will then propose an extension of the concept of self-presence, entitled objective self-presence. The second section of the paper will provide a general introduction to the submitted game Illusion Master, briefly discussing its main plot and features in relation to the concepts outlined in the first section. This will act as a springboard to an informal analysis of the design decisions taken in the game vis-a-vis the intentions outlined. The concept of the feeling of presence vis–à–vis virtual technologies has been widely discussed over a number of years (see e.g. Minsky, 1980; Steuer, 1992; Biocca, 1997; Lombard & Ditton, 1997; Wirth et al., 2003; Lee, 2004), and more recently, applied to digital games (see e.g. McMahan, 2003; Tamborini & Bowman, 2010; Tamborini & Skalski, 2006; Weibel & Wissmath, 2011). Most of these studies, albeit being related in concept, hail from different fields. However, following the footsteps of Lombard and Ditton, (1997) many researchers seem to be in general agreement that, in somewhat limited terms, a perception of non-mediation lies at the centre of presence inducing experiences, including digital games. (Biocca, 1997; Tamborini & Bowman, 2010) This refers to a state where while playing a game, the player is also likely to not be aware of the game medium while playing. This has also been referred to as immediacy in Bolter & Grusin’s (1999) seminal book Remediation. Indeed, when elaborating on the state of presence in digital games, Tamborini and Bowman (2010) start by vaguely defining presence as the perception of non-mediation, which make the term not only applicable towards experiences with virtual technologies, but any mediated experiences. Lee (2004) also tentatively defines the term as a “psychological state in which the virtuality of experience is unnoticed” (p. 32), thus once again highlighting the fact that the medium becomes invisible to the user. At the heart of this non-mediation, which seems to be an integral aspect of the conceptualization of presence, one can also make solid links to other concepts that have also been analyzed as part of the broader study of presence. These include immersion (eg. Biocca & Delaney, 1995; Palmer, 1995), and self-presence (Lee, 2004; Tamborini & Bowman, 2010), which along with the concept of illusion (Grau, 2003) are being challenged in this paper and through the design of the submitted artefact Illusion Master. Apart from the feeling of non-mediation mentioned earlier, various approaches to the theory of presence seem to imply an additional separate virtual subject when playing a game, which is one of the main points that differentiates presence from self-presence. To elaborate on this and give some examples, Steuer (1992) defines presence as “the extent to which one feels present in the mediated environment, rather than the immediate physical environment”, (p. 76) referring to a feeling of being there, and also linking it with the feeling of immersion and involvement in a virtual environment. In relation to digital games, self-presence accounts for this separate virtual subject and is simply defined as the way players feel as if their virtual self is their actual self (Lee, 2004; Tamborini & Bowman, 2010). As a sidenote, Yee & Bailenson (2007) show how players also take on different characteristics in the way they interact with others in a game depending on the attractiveness of their avatar, thus emphasizing how much even the physical looks of the virtual self has an impact on the behaviour of the player. Biocca (1997) was the first to define the particular term self-presence (as opposed to presence) and identified three bodies: The actual body of the user interacting with the virtual environment, the virtual body which acts as the virtual representation of the actual body, and the body schema, defined in this case as ‘the user’s mental or internal representation of his or her own body’ (Biocca, 1999, n.p.) affected by the type of virtual representation. The differentiation between presence and self-presence here is crucial given that in Illusion Master, players take control of a virtual body, i.e. the playable magician. Immersion as a broad concept has been applied to various media experiences, including film, television and games. It has also been explained in relation to the concepts of presence, flow, and non-mediation (see e.g. Lombard & Ditton, 1997; Wirth et al., 2007; Murray, 1997). This can all be very well linked with the term suspension of disbelief, introduced by Samuel Taylor Coleridge in 1817. Referring mostly to written texts at the time, he states that if a writer is able to fill the work with “human interest and a semblance of truth”, a reader would suspend the disbelief of the fictional work, and instead embrace it (Coleridge, 2009, p. 239). Indeed, this concept has also been applied to games, particularly by Janet Murray (1997) who also focuses on the concept of immersion in the experience of digital games. The ability to escape from real life, as well as the ability for a game to immerse its players seem to remain key characteristics in the design of popular games today. In fact, even Coleridge’s concept of suspension of disbelief is discussed in relation to the goal of game design ‘because games often deal with fantasy and exaggeration and require that players to some degree “buy into” the fantasy to support engagement and immersion’ (Dickey, 2015, p. 48). Similarly, in her seminal book Hamlet on the Holodeck, Janet Murray (1997) directly equates the feeling of being transported into a virtual environment with the experience of immersion. Murray describes immersion as “the experience of being transported to an elaborately simulated place” (p. 98). She compares this feeling to “the feeling of being submerged in water where we are surrounded by a completely other reality…that takes over all of our attention, our whole perceptual apparatus.” The idea of transportation implies that while immersed in a game, players’ consciousness is transported from the actual world, to the game world. This is highly criticized by Salen & Zimmermann through the double-consciousness model which we are going to look at briefly. Similar to presence, the feeling of immersion has been approached in a variety of ways over the years. Lack of authenticity in a game story for instance has been seen as an aspect which hinders both immersion and presence (Rigby & Ryan, 2011). Brown & Cairns (2004) focus on the concept of immersion by conducting experiments and interviewing gamers. They break down the feeling of immersion into three: engagement, engrossment and total immersion, which they equated with a feeling of presence. In their study, they establish how immersion is not a static experience and also mention how the controls must be ‘invisible’ (a clear link to the experience of non-mediation) for total immersion to take place. What’s striking about Brown and Cairns’s study is that they draw parallels between immersion and the concept of flow (Csikszentmihályi, 1990). Flow represents the feeling of immersion in any activity that also involves a high level of enjoyment and fulfilment (Chen, 2007), and was originally described as “the state in which individuals are so involved in an activity that nothing else seems to matter” (Csikszentmihályi, 1990). In this state also known as the zone, players are immersed and highly involved with full focus in the activities presented in the game. Similar to immersion, this is a fragile state which can easily be broken. The study on immersion in games by Jennett et al (2008) also draw parallels between immersion and flow. They state that “like immersion, when in the flow state people become so absorbed in their activities that irrelevant thoughts and perceptions are screened out” (p. 6). Indeed, the boundaries between immersion and flow are at times very unclear given there are various definitions which are at times conflicting. For instance, Nacke & Lindley (2008) relate immersion with complex and exploratory virtual environments, a narrative context, a variety of models and textures, as well as dynamic lighting. In contrast, they state that flow is “concentrated on the sequence, pace and difficulty of challenges, [rather] than on environmental settings”. It is of course not the aim of this paper to exhaust the possible differences and similarities between flow and immersion. However, one of the shared characteristics (apart from the feeling of non-mediation mentioned in relation to both presence and immersion) is the loss of self-awareness and being cut off from reality. (Brown & Cairns, 2004) It is this loss of self-awareness that the paper and game seek to challenge. Before that is done however, we must look at the concept of illusion. The subject of illusion shares a lot of similarities with the mentioned subject of immersion, which Illusion Master wilfully attempts to challenge. It makes sense to refer to the concept of illusion here given that it not only has clear links with immersion, but the game itself tackles this subject as a fitting metaphor for both immersion and presence. The definitions of immersion proposed by both Grau and Murray thus also move very much hand in hand with presence, described earlier as a feeling where the virtuality of experience remains unnoticed (Lee, 2004). According to Grau, two forms of illusion can be described: conscious illusion and unconscious illusion. Conscious illusion happens when a reader feels she is seeing what is being represented in the virtual work. If we use an example with Illusion Master, players see that they are playing as a magician, running along rooftops shooting ghosts. Thus when illusion is conscious, players know that there is no magician beyond the projected image. The second form of illusion mentioned is unconscious illusion, and this is directly equated with immersion according to Grau. During unconscious illusion, the medium itself becomes invisible, and thus immediate to the player. In the case of games, this could happen when players are totally captivated by the virtual environment, so much so that it becomes something they are totally unaware of as players outside this virtual environment. Grau states that when illusion becomes unconscious, users become immersed in that particular environment. In this situation of unconscious illusion, players are thus immersed and self-present in the virtual environment. The shift from unconscious to conscious illusion is the intention behind Illusion Master and arguably acts as a way for players to reflect on their relationship with the medium and on broader concepts such as immersion and self-presence. The next section of this paper will demonstrate how the design decisions taken in Illusion Master are meant to challenge the related concepts of immersion and presence by pushing players to become objectively self-present. This is an extension to the generally understood definition of self-presence which will now be discussed. The feeling of presence that is currently being referred to requires the virtuality of experience to remain unnoticed (Lee, 2004). It seems however problematic to limit or define the feeling of self-presence in this manner for a number of reasons. Both concepts of presence and immersion as mentioned so far do not seem to factor in the doubling effect that may be at play when gaming. While playing a game, a player is arguably still very much aware of himself in front of a screen. The player is what enables the avatar in the game object (the virtual self) to take actions which ultimately cause a change to the game object. While the analysis of the blurry relationship between the player outside the game and the virtual self lies beyond the scope of this paper, it is nonetheless important to highlight how their relationship cannot simply be considered vis-à-vis characteristics such as non-mediation, immersion, and transportation. Presence and immersion in general as concepts becomes particularly more problematic when considered vis-à-vis the double-consciousness model, introduced by Salen & Zimmermann in their book Rules of Play (2003). Double-consciousness can be defined as a situation wherein the players are “well aware of the artificiality of the play situation” (2003, p. 451). In being aware of this artificiality, it can be argued that players are thus also aware of themselves playing, lending to the idea of double-consciousness which was already referred to in phenomenology by Eugene Fink in 1968 where he used the phrase double existence. Both these terms describe an inherent situation to any form of play where “while playing, man retains a knowledge of his double existence, however greatly reduced this knowledge may be” (Fink, 1968, p. 23). Salen & Zimmermann attack what they deem as the immersive fallacy in gaming which they define as “the idea that the pleasure of a media experience lies in its ability to sensually transport the participant into an illusory, simulated reality,” (p. 450) Indeed, unlike the feelings of presence or immersion, this model negates the idea that a player is transported into another environment, instead looking at the relation between the player and the character in the game. It is also worth noting here Gordon Calleja’s (2011) concept of incorporation, which he defines as “the absorption of a virtual environment into consciousness, yielding a sense of habitation, which is supported by the systemically upheld embodiment of the player in a single location, as represented by the avatar” (p. 169). Described in such a way, the concept might seem or sound similar to the concept of immersion. However, it is not unidirectional like immersion is, i.e. it does not discuss the transportation of the player into a game world without taking into consideration the player’s involvement with the game. To further add to these perspectives, Vella’s player-figure relation model (2014) analyses a phenomenological duality in play, which looks at how players can relate to the playable figure in a subjective or objective manner. In the subjective mode of relation, the player feels she inhabits what Vella refers to as a ludic-subject position and identifies with the game avatar as “I”. This is not to say that the player would feel she is the character within the game, but rather that the player feels her subjectivity stands in the game. This is the feeling typically associated with presence and immersion, mentioned earlier. Conversely, in an objective mode of relation, the playable figure “becomes itself present to the player as an object of perception” (p. 3). To summarize, “the distinction is one of playing the figure [subjective] versus playing with the figure [objective]” (p. 3). While acknowledging that players might feel as if their virtual self is their actual self when playing a game, or that players might be transported into a simulated place that immerses them by taking over all their attention, this view of presence and immersion has been shown to be quite limiting. This objective self-presence proposed in this paper is in many ways similar to the objective mode of relation (Vella, 2014) mentioned earlier where the playable figure “becomes itself present to the player as an object of perception”. However, I argue that in the feeling of objective self-presence, it is not simply the playable figure which may become the object of perception to the player, but also the game technology as a whole. In this sense, while acknowledging that players most of the time do not necessarily focus on the mediatory technology (such as a computer or a game console), or the avatar as a separate subject from themselves (as is the case with the subjective mode of relation) when playing a game, I argue that players may still become aware of the virtual experience of digital games. Based on the more widely understood concept of presence, what is being proposed here equates to a situation where one might conclude that the player is no longer present or immersed in the game environment. Conversely, I argue that instead of viewing this as a situation where players are no longer present, objective-self-presence describes a further layer of presence where the player becomes reflectively conscious of her involvement with the game technology. There are also clear similarities between the proposed objective-self-presence and the double-consciousness model (Salen & Zimmermann, 2003). Double-consciousness however seems to describe an inherent, and thus constant situation in play. What is being proposed here however is that while players, as Fink stated, “retain a knowledge of their double existence” (1968, p. 23), they might not constantly be reflectively conscious of the fact that they are human entities outside the game. In other words, players have the potential to become aware of the artificiality of the play situation at all times, rather than being constantly aware of this phenomenon during gameplay. The next section of the paper will analyse the submitted game artefact Illusion Master in relation to the proposed concept of objective self-presence. 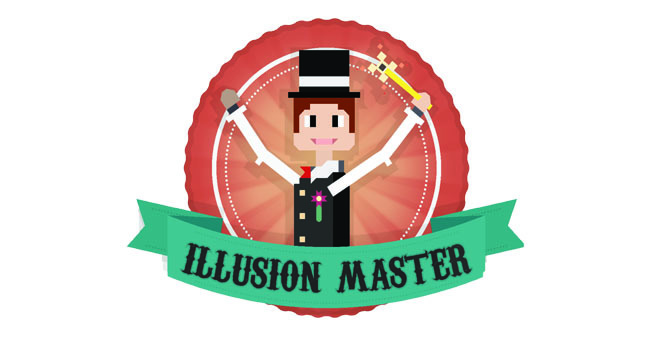 Illusion Master is a short casual 2D platformer which lets the player take on the role of an unnamed magician who has his magic chest stolen by a mysterious entity. In this stolen chest lies the ultimate power of illusion which the magician needs for that night’s performance. Unable to do his performance without his magic tricks, he embarks on a dangerous quest on the theatre rooftop to retrieve his magic chest, only to find various ghosts along the way which he needs to shoot using his wand to keep progressing and level up. After three minutes shooting ghosts and jumping on the rooftops, the magician mysteriously ends up in his own theatre facing two bosses. Once the first boss is killed, a bigger version of what seems to be an evil clone of the same magician appears and claims to hold this power of illusion. However, shooting the evil clone as generally expected from traditional games will all be in vain. Players can only win if they step out of the ‘immersion’ created by the same game and become aware of themselves as players outside the game environment interacting with a game object. Only by doing so will they retrieve back the power of illusion that was stolen from the magician at the beginning of the game. Only when they do so and stop playing will they win, as they would have become aware of the ‘illusion’ of play. In other words, the boss in the game loses all the power when the player realizes she holds this power instead, thus also realizing she is ‘objectively present’ as a player outside the game. Once the players manage to beat the magician, the magic chest appears at the centre of the screen. Once opened, this reveals the source of the ultimate power of illusion – an image of the actual player playing the game. Illusion Master ends there. In the initial prototypes of the game, it was resulting difficult to find a way to get players to realize how Illusion Master was really about an extension of the subject of self-presence. This was more so because the state of objective self-presence proposed had to be conveyed through gameplay, and not in any other form of explanation. How could a player achieve the proposed state of self-presence? The way we ultimately attempted to do this was through making the game as immersive as possible and then quickly breaking this same immersion that allegedly get players present (in the traditional definition) in a game. It is argued that a player could more easily feel objectively self-present as proposed in this paper by being pulled away from immersion first. In the coming sections, the paper will look at the design elements which aim to create immersion, and then later on break it in the game. Before this is done however, I’d like to situate Illusion Master among other games that also deliberately make the player aware she is playing a game such as the Metal Gear Solid series (1998), The Stanley Parable (2013), and Atum (2012). What stands out in Illusion Master, I would argue as both writer and game designer, is that the intentions of making the player aware she is playing a game are meant as a direct challenge to the game concepts of immersion, presence and unconscious illusion, rather than being merely features of the games. Furthermore, as will be seen later on, the player has to realize himself that she has to stop playing the game to win. As a short experience, Illusion Master was created to be as immersive as possible. This is attempted in a number of ways through the design of the game. Genre and aesthetics. The choice behind the genre and aesthetics of the game are not coincidental. When designing Illusion Master, it was a design decision to give the game a retro and colourful look in terms of genre & aesthetics. Indeed, the aesthetics chosen for Illusion Master are inspired by the fun & colourful classic 8-bit and 16-bit platformer games emanating from the Super Nintendo and Sega Genesis years during the late 80s to mid-90s. This aesthetic could appeal to both children, but more importantly to people in their late 20s and early 30s who would more likely have more fond memories of these games. The iconic retro game elements used in Illusion Master included not only the visuals, but also the sound effects, and the chiptune music used. Other iconographic elements are present throughout, such as the menu graphic, which pays homage to the character pose in the menu of Sonic the Hedgehog (1991), the death traps on the rooftops, as well as the death animation of the magician character. The controls of the game, which will be mentioned later, were also designed keeping in mind the simple controls generally associated with traditional platformers. Having said all this, it was also the intention to make the game seem contemporary. Initially, 8-bit graphics were going to be used in the game, but this idea was later scrapped to make the visual assets look more contemporary, and instead seem like tribute was being paid. Also, despite the fact that the main level of the game ends after 3 minutes, we wanted to use conventions which are common in endless runner games, which have been very popular as casual games on mobile devices (Schick, 2013). Casual game elements. Illusion Master was designed with the intention to be a casual game experience. Casual games according to Jesper Juul (2010) are generally easier to play, pleasant, short, appeal to a wider audience, and involve positive fictions. It was the intention to incorporate as much of these elements in the game design as possible, and in doing so, make the game more appealing and immersive to a wider audience from the onset. For instance, children are targeted as possible players of the game, despite the fact that they might not understand the conceptual intention of the game. Indeed they could still find it enjoyable and relate the experience to the magician character. The game was designed as a short experience, in which the player could reach the end state in between 5-10 minutes. Furthermore, once the player reaches the end state and the contents of the magic chest are revealed, the core concept of the game would also be uncovered. In this sense, the game is meant to be played once, and not designed with replayability in mind. As the game is meant to be played once, the intention is to make the game even more appealing and immediately immersive. The general look of the game was designed with positive fictions in mind. This is reflected in the colour palette used throughout. Apart from the colours used, the overall tone of Illusion Master also remained positive, while keeping the conflict of the character intact at all times. Both the magician character as well as the enemies were designed to be as cute as possible. Both the ghosts and the bosses were made to seem menacing, albeit in a fun way. The casual elements in Illusion Master are also reflected in the relatively easy game controls designed for the game. Since the game is designed to be played only once, it was highly crucial that the game was simple enough to grasp. In this respect, the game was designed in a way so that the player would only need to worry about three controls – two fire keys, and a jump key. The simple controls of the game meant that anyone from any age could more easily get into the game, without having to spend too much time getting used to the controls. More on the game controls will be discussed later. Of course, the simplicity of the controls does not necessarily reflect the difficulty of the game. Balancing difficulty according to different players’ capabilities, as well as providing adequate feedback were other crucial issues that could affect the immersion created through the game. The flow zone and immersion. When designing the game we wanted it to be both relatively easy to play and grasp, but also provide enough of a challenge to keep players interested. The challenge in the design was in finding the right balance so that it could appeal to both experienced and non-experienced gamers. The idea of finding the right balance in the game was inspired by Mihaly Csikszentmihalyi’s concept of flow. According to the theory of flow, in order for players to enter this state of flow, players should experience three elements. Firstly, they should find that the game has a clear direction and goals. In the case of the Illusion Master, players know that they are trying to retrieve the stolen magic chest. They are also prompted to be curious as to what the mysterious power of illusion is. Secondly, the game needs to provide adequate feedback to the players, which we tried incorporating in the game through various feedback mechanisms. These include the sounds used when the player makes a good or a bad choice. Another aspect of feedback included in the game was the character’s levelling up system, which was included at later stages in the design of the game to act as an extrinsic motivator for players to keep improving their performance. The 5-level system thus also aims to keep players immersed in the game. Every time the player manages to kill a ghost, the character gets a point. Five points would allow the player to level up. On the other hand, players would go down 5 points, hence one level, every time they are hit, pushing the player to avoid making mistakes. Of course the levelling system works in tandem with the difficulty of the game. Finally, a progress bar at the top right of the screen acts as a reminder to show how far the players have managed to progress in the roof top, also creating anticipation as to what would happen once the end of the progress bar is reached. The third and final requirement of flow is the balance of difficulty mentioned at the beginning of this section, which works in tandem with the level the player would be in at the time. This was one of the hardest issues to tackle. According to the theory, an activity can only keep one immersed if it provides the person with a challenge that is not too hard, but also not too easy. If players find a game too difficult, they might feel too anxious, and as a result stop being immersed in the game. Similarly, players could also stop being immersed if they get bored as a result of the game being too easy. The design of Illusion Master attempts to keep players of varying skills in the flow zone by adapting the level of difficulty based on the players’ performance. In the main rooftop section of the game, the more the player manages to kill ghosts without making mistakes, the faster the ghosts run towards the player. If a player makes a mistake, the character level goes down, but the ghosts slow down as well, giving the player more time to concentrate. In the initial prototypes of the game, it was shown how despite the different speeds of the ghosts, tested players were still finding the game quite easy. To counteract this, two different coloured ghosts were created, which corresponded to two different shooting keys on the keyboard. In this sense, players now had to focus on not only keeping up with the ghosts, but also keeping in mind which keys to press. Once the game manages to get the player immersed, the next step was to create a situation where the same immersion could be broken in a way that made sense with the context of the game story. One of the toughest challenges was to think of a story that could easily allow and justify this breaking of immersion to occur. The character of a magician seemed to be a good choice given his traditional role involves immersing his audiences in the illusion of magic. For the duration of a magic performance, audiences are likely to stop seeing magic as manipulative tricks, and instead get immersed in the illusion that what they see is actual magic. Arguably, and in a similar fashion, players are likely to play a good game and immerse themselves in it, possibly also forgetting they would be playing a game. A strong parallel thus existed between the magician and a game, as well as a link between magic show audiences and players. During the gameplay of Illusion Master, the player is however put in a conflicting situation. She plays as both a member of the audience, as well as the magician whose job is to immerse his audiences with his magic tricks. In this sense, the magician in the game is trying to retrieve his power to immerse his audiences, while the player, in helping the magician, is also trying to regain this power of illusion. Since the player is the one that is ultimately controlling the magician, then it also seems to be logical to deduct that the power of illusion (or the power of immersion) also lies in the player who decides to engage with the game in the first place. The ability for the player to break immersion appears at the end state of the game, when the player magician faces an evil clone of himself. It is subtly implied in the game dialogue that this evil magician is empowered by the player magician’s shooting. Indeed, the player will never be in a situation to win if she keeps shooting the evil magician. If players decide to keep doing this, as is generally expected from traditional platformers, they would only be giving the evil magician / game the power of illusion that the player magician is desperately trying to retrieve. It is worth pointing out here that illusion was chosen as the subject to be challenged rather than directly tackling immersion and self-presence. The reason for this is that the former feels very much appropriate within the game context. Indeed, it does make more sense to show how a magician character in the game has lost his power of illusion, rather than his power of immersion. Designing a way for players to realize they needed to stop playing without making it seem like a game requirement proved rather trivial. Indeed, if at any point, the player were to follow any specific instruction by the game to stop playing, then the player would have arguably still been immersed when taking the decision. Instead, the player had to realize on her own. Should the player realize she needs to stop playing to win, the evil magician finally dies and the stolen magic chest finally appears. I would like to focus briefly on this final boss fight in the game. Should the player keep interacting by shooting the evil magician, then she is perpetuating her immersion within the game. The player’s immersion in the game is ultimately what the evil magician requires in order for him to remain alive and hold on to the power of illusion. Thus, the reason the final evil magician dies when the player deliberately stops playing is that he realizes he no longer has the power to immerse the player. Thus at this stage, the power of illusion is finally handed to the player. Furthermore he is shown to have identical features to the protagonist as a hint to the player that the evil magician, who at that stage holds the power of illusion, is actually the same as the player who really holds this power without realizing it. Once the player beats the final magician, the player is no longer in control of the magician in the game, who walks towards the magic chest on his own. It is this crucial moment that shows that the power of illusion ultimately belongs to the player, who initially decided to embark on this journey with the magician in the first place. It is thus the player who could all along decide whether to be immersed or not in the game. This phenomenon is experienced through the player becoming objectively self-present, i.e. when she becomes reflectively conscious of the fact that she needs to reconfigure the way she relates with the avatar and interacts with the game device. The aim of this paper was to propose a further layer of the feeling of self-presence in games, as well as to challenge the concept of immersion associated with it. Illusion Master was used as a case study to analyse the proposed extension of the definition of self-presence through a game, which arguably attempts to make the player aware of herself playing the game, as well as her relationship with the game medium. The proposed feeling of objective self-presence, as well as the challenging of the concept of immersion contrasts with the characteristics of the same concepts as popularly understood in games studies. I ultimately hope that this discussion will open up new avenues for the study and analysis of presence in digital games, as well as add to the current definition of self- presence. Click here to read excerpts from the reviewing process. Biocca, F. (1997). The Cyborg’s Dilemma: Progressive Embodiment in Virtual Environments. Journal of Computer-Mediated Communication, 3(2). Brown, E. and Cairns, P. (2004). A grounded investigation of game immersion. Extended Abstracts of the 2004 Conference on Human Factors in Computing Systems. Vienna, Austria. pp. 1297-1300. Bolter, J. and Grusin, R. (1999). Remediation. Cambridge (MA): MIT Press. Calleja, G. (2011). In-Game. From Immersion to Incorporation. Cambridge(MA): MIT Press. Chen, J. (2007) Flow in Games (and Everything Else). Communications of the ACM, 50 (4), pp. 31-34. Coleridge, S. (2009). Biographia literaria. Auckland, N.Z. : Floating Press. Csikszentmihályi, M. (1990) Flow. New York: Harper and Row. Dickey, M. D. (2015) Aesthetics and Design for Game-based Learning. New York (NY): Routledge. Jennett, C., Cox, A., Cairns, P., Dhoparee, S., Epps, A., Tijs, T., & Walton, A. (2008). Measuring and defining the experience of immersion in games. International Journal Of Human-Computer Studies, 66(9), pp. 641-661. Juul, J. (2010). A Casual Revolution. Cambridge (MA): MIT Press. Grau, O. (2003). Virtual Art: From illusion to immersion. Cambridge (MA): MIT Press. Lee, K. M. (2004). Presence, explicated. Communication Theory, 14(1), pp.27-50. Micallef, J. F. (2016). Play, effect, reflect: A phenomenological study of reflective self-consciousness in players’ experiences of digital games. Proceedings of the 2016 Philosophy of Computer Games Conference. Valletta: Malta. Murray, J. (1997). Hamlet on the Holodeck. The Future of Narrative in Cyberspace. Cambridge (MA): MIT Press. Nacke, L., & Lindley, C. A. (2008). Flow and immersion in first person shooters: Measuring the player’s gameplay experience. Proceedings of the 2008 Conference on Future Play. pp. 81 – 88. Rigby, S. & Ryan, R. M. (2011). Glued to games: How Video Games draw us in and hold us spellbound. Westport (CT): Praeger Pub. Salen, K., & Zimmerman, E. (2003). Rules of play: Game design fundamentals. Cambridge (MA): MIT Press. Sartre, J. (1956). Being and Nothingness: An Essay on Phenomenological Ontology. New York (NY): Philosophical Library. Steuer, J. (1992). Defining Virtual Reality: Dimensions Determining Telepresence. Journal of Communication, 42(4), pp.73-93. Tamborini, R. & Bowman, N. (2010). Presence in Video Games. In C.C. Brecken & P.D. Skalski, Telepresence in Everyday life. (pp. 87-104). New York (NY): Routledge. Vella, D. (2014). Player and Figure: An analysis of a Scene in Kentucky Route Zero. Proceedings of the 2014 International DiGRA Nordic Conference, Gotland: Sweden. Yee, N., Bailenson, J., & Ducheneaut, N. (2009). The proteus effect: Implications of transformed digital self-representation on online and offline behaviour. Communication Research, 36, pp. 285-314. Games on Games. Game Design as Critical Reflexive Practice.